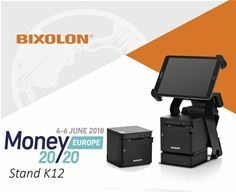 As Europe leads the Fintech market, BIXOLON will be encouraging visitors to discover its growing portfolio of dynamic printing solutions for the payment marketplace on stand K12, at Money 20/20 Europe 2018 (4-6 June 2018, RAI, Amsterdam). SRP-Q300 Series – BIXOLON’s first 3-inch (80mm) Direct Thermal compact Receipt and Ticket printer, with flexible mPOS configuration capabilities, the SRP-Q300H. Featuring an intelligent hub (B-gate), connecting up to 4 USB peripheral devices (scanner, cash drawer, customer display, RFID reader, scales, etc.) to the host tablet (via Bluetooth) and providing a single charging port. Printing receipts or online orders through a native, web and cloud-based mPOS application with B-gate SDK’s (Software Development Kits). BIXOLON will be pairing the printer with its new LCD customer Display (BCD-3000) and a robust steel tablet stand (RTS-Q300) which safely secures up to a 10inch tablet using a locking mechanism and 170° forward-tilting feature to provide a complete EPOS payment solution. Mobile Printer Series – BIXOLON’s dynamic range of 2”, 3” and 4” mobile printing solutions ideal for multi-functional mobile payment. Including the SPP-R210 super compact mobile printer, alongside the sleek and lightweight SPP-R200III, SPP-R310 and SPP-R410 next generation mobile printers with NFC auto-pairing and more. To find out more, visit BIXOLON at www.BixolonEU.com or contact sales@Bixolon.de to make an appointment to meet the team. BIXOLON is a leading global manufacturer of innovative, advanced printing technologies including point-of-sale receipt, label, Auto ID and mobile printers for a wide range of environments. Millions of BIXOLON printers are used today in retail, hospitality, healthcare, banking, ticketing, post/parcel, warehousing and other transaction-intensive industries. In 2017, for the fourth consecutive year BIXOLON was named global mobile receipt printer market leader by Japanese research company Chunichisha, securing a 32.9% market share.